According to the U.S. Department of Agriculture (USDA) Agricultural Marketing Service, food deserts are defined as “urban neighborhoods and rural towns without ready access to fresh, healthy, and affordable food.” The USDA categorizes food deserts by census tract—a small, relatively permanent subdivision of a county usually containing about 4,000 people and 1,600 housing units used by the U.S. Census Bureau for statistical purposes. qualify as low-access communities, based on a determination that at least 500 persons and/or at least one-third of the census tract’s population live (a) for urban areas, more than one mile from a supermarket or large grocery store, and (b) for rural areas, more than 10 miles from a supermarket or large grocery store. Communities within census tracts identified as food deserts may have low access to healthy and affordable food for different reasons. There may be a lack of grocery stores or supermarkets, leaving the communities dependent on fast-food restaurants and convenience stores offering few healthy and affordable food options (see Human | Health | Access to Healthy Food). Affordability is of great significance: the USDA designation of food deserts incorporates, by definition, low-income census tracts, and residents may not be able to afford fresh, healthy food even if it is available (see Economic | Income | Poverty). Access to transportation is another important factor. Low-income residents may not be able to afford to own, operate, and maintain a car in urban or rural settings, and in rural areas public transit services may be sparse or non-existent. Mountainous terrain—such as that found in Western North Carolina—may exacerbate situations where access to transportation is a factor. 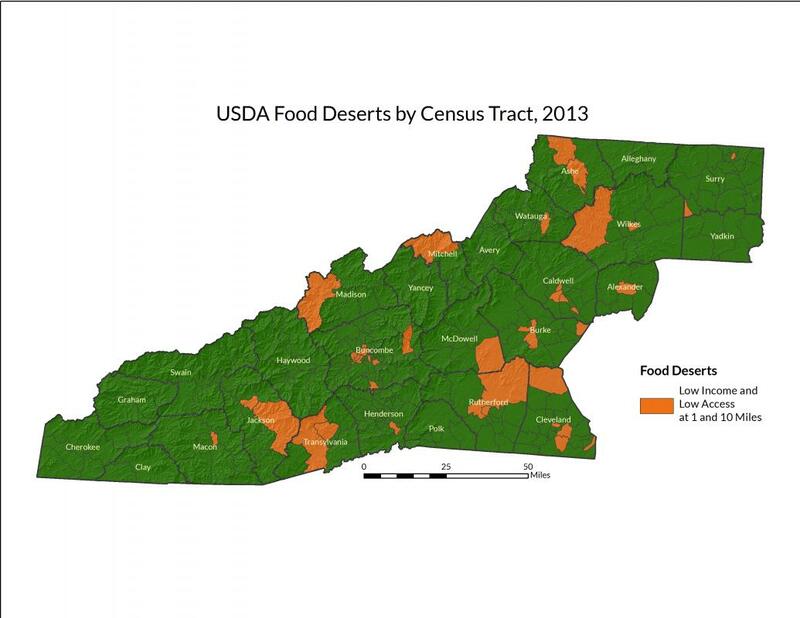 Of the 320 census tracts in Western North Carolina, nearly 14 percent, or 44 tracts, are designated as food deserts. Foods deserts in the region range from densely populated tracts in or around metropolitan areas—such as Asheville, Hendersonville, Lenoir, Morganton, and Shelby—to large, rural, sparsely populated tracts in Ashe, Cleveland, Jackson, Madison, Mitchell, Rutherford, and Wilkes counties. Regional food deserts can be found in counties with higher rates of poverty, such as Rutherford, Jackson, and Wilkes, but they are also seen in counties with low poverty rates, such as Henderson County—which boasts the lowest poverty rate in the WNC region. Many of the region’s food deserts are within census tracts that have larger areas (averaging about 30 square miles each), and occupy 12 percent of the area of the entire region. This would suggest that the majority of the food deserts are in more rural areas, as rural census tracts are typically much larger in area than urban tracts. However, only 20 percent of these food deserts have less than 100 people living per square mile. One of these census tracts, for example, is within Madison County and has only about 18 people living per square mile in an area of 127 square miles. 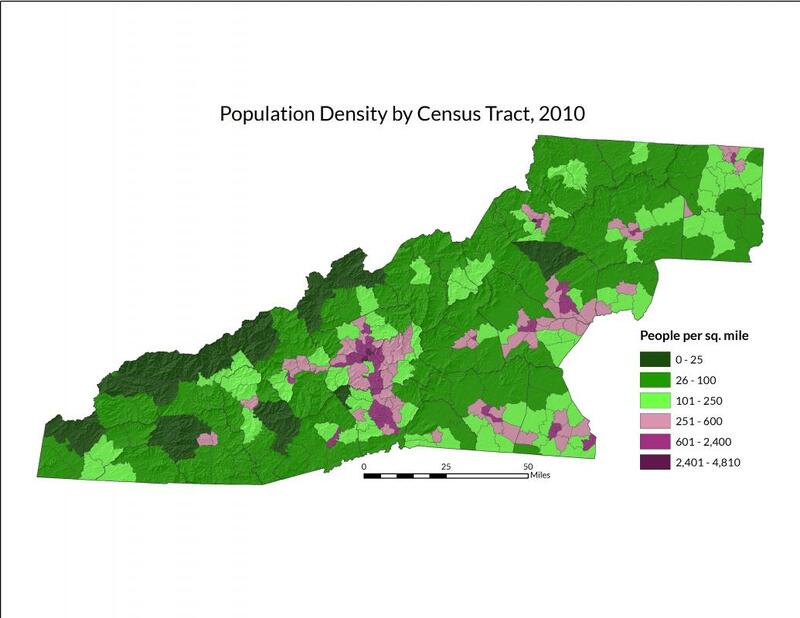 Despite the large area of many of these census tracts, it is the communities near urban centers—such as in Asheville in Buncombe County or Lenoir in Caldwell County—that have higher population densities per census tract, and are more likely to have higher populations of people with lower incomes and lower food access per square mile. Within the region, one-quarter of all food deserts have greater than 1,000 people per square mile. For example, the census tracts within and immediately surrounding Asheville that are both low income and low access (at 1 and 10 miles) have populations that, together, make up nearly 18 percent of the region’s entire population. This underscores the importance of healthy food access in both urban and rural communities alike. The Appalachian Foodshed Project has assembled county profiles containing data relevant to community food security for each county in its region. To generate county food security profiles for the WNC counties that are a part of that region, please visit the Appalachian Foodshed Project County Profiles webpage. Click here to download the Western North Carolina Community Food Security Assessment (pdf, 22.7 MB). U.S. Department of Agriculture, Economic Research Service. Food Deserts. Data from 2010; Accessed October 2014 from: http://apps.ams.usda.gov/fooddeserts/fooddeserts.aspx.